The former home of Irish politician Daniel O’Connell, Derrynane House is packed with period furnishings and exhibits related to the statesman, who campaigned for Catholic emancipation in the 19th century. The house sits within Derrynane National Historic Park, which encompasses woodland trails, walled gardens, and scenic shoreline. Visitors to Derrynane House can take a self-guided tour of the interior, exploring the dining room, study, drawing room, library, and chapel. Also on display is the gilded chariot that carried O’Connell through Dublin following his release from Richmond Bridewell prison in 1844. The house is often visited as part of Ring of Kerry tours, which stop at other sights along the scenic route, such as Ballycarbery Castle, Valentia Island, and Cahergall and Leacanabuaile forts. Derrynane House is a must-see for Irish history buffs and families, who will enjoy the trails in the surrounding parkland. Guided tours for groups of up to 25 people are available. A tearoom at the house is open from Easter through September. Derrynane House is wheelchair accessible. Derrynane House sits on the Kerry coast, about a 5-minute drive from the village of Caherdaniel. Caherdaniel is on the Ring of Kerry, which circumnavigates the Iveragh Peninsula. There is visitor parking available. If you aren’t driving, it’s best to visit Derrynane as part of a tour that includes round-trip transport. The best time to visit Derrynane House is in summer, when mild weather allows visitors to make the most of the walking trails on the grounds. The estate closes for much of winter, usually from mid-December to mid-March. 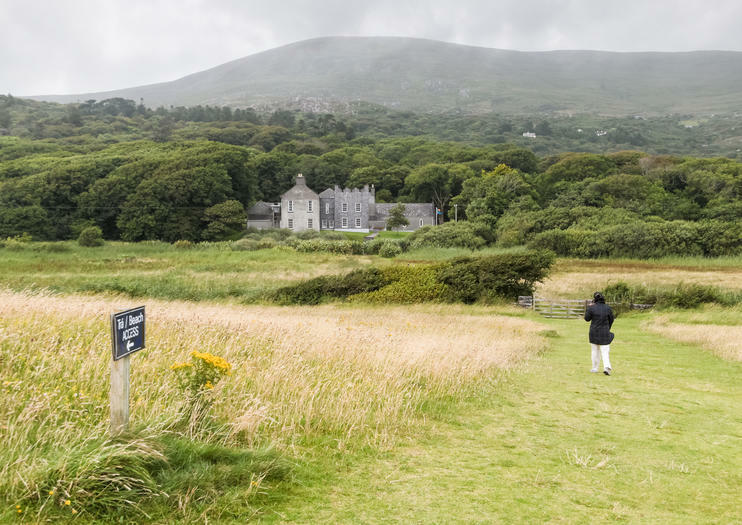 The gardens and parklands surrounding Derrynane House are crisscrossed with trails. Follow woodland paths leading down to the beach and look for rare subtropical plant species, such as ferns and giant rhubarb, which manage to thrive here thanks to the warming influence of the Gulf Stream. Families can pick up a map of the Derrynane Fairy Trail in the on-site tearoom and set out in search of the small fairy hideaways that are scattered around the woods. Marvel at some of Ireland’s most beautiful landscapes on this private Ring of Kerry tour from Killorglin. Head deep into the Iveragh Peninsula with your private guide and discover famous landmarks including Cahergall Fort, Leacanabuiaile Fort and Ballycarbery Castle. Pass through quaint villages such as Kenmare, Sneem and Waterville, and enjoy an altogether more relaxed pace of life in the Irish countryside. Admire top attractions like the Torc Waterfalls and Cromwell's Bridge, and enjoy the freedom to plan your own route with your private guide. Discover top attractions and hidden jewels on the Emerald Isle on this private Ring of Kerry tour from Sneem and Parknasilla. Delve into the beautiful Iveragh Peninsula with your private guide. Take in top landmarks such as the medieval fortresses of Cahergall and Leacanabuiaile, the Torc Waterfalls, Ballycarbery Castle and Cromwell's Bridge. Explore pretty villages like Cahersiveen, Killorglin and Sneem and enjoy a pace of life far removed from the city. During your private tour, stop where you like and make the most of your time on Ireland’s Iveragh Peninsula. Choose your own route through the Emerald Isle and hit the highlights you want to see on this private Ring of Kerry tour from Cahersiveen. Explore the Iveragh Peninsula with your private guide and discover top landmarks such as Ballycarbery Castle, Cromwell's Bridge, Ross Castle, the Skellig Ring, the Stone Circle and the Torc Waterfalls. Marvel at the medieval fortifications of Cahergall and Leacanabuiaile, and pass through quaint towns such as Kenmare and Waterville. Take the Coomakista Pass for spectacular views, and enjoy the freedom to stop wherever you’d like.